In order to wage intergalactic warfare, aliens abduct all of Earth’s artists : it turns out that the most powerful weapon in the universe is the violent, transcending beauty of poetry. Back on Earth, people don’t really seem to care about the disappearance of painters, sculptors and other such creators – until they discover art inspires industrial design which, in turn, makes it possible to create elegant new kitchen counters. While artists master the deadly potential of their craft, earthlings are learning the hard way that art isn’t as useless as it seems… while listening to old CCR hits on repeat. 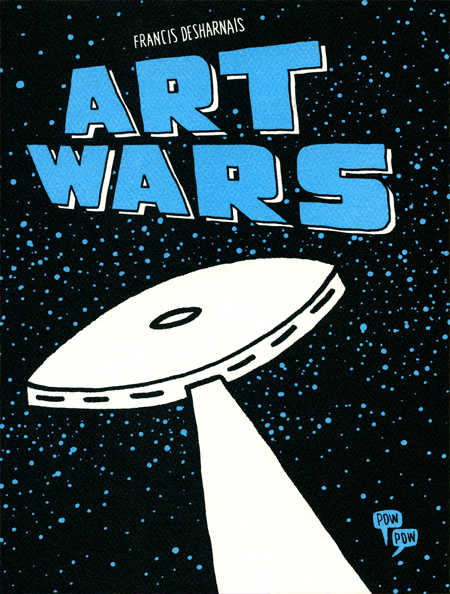 An imaginative and dead-on satire of the place culture occupies in contemporary societies, Art Wars is constructed using only ten different panels – making it a bold and clever experiment in comic minimalism, inspired by both the avant-garde work of OuBaPo and the author’s own background in animation.